The first issue of Elvis Monthly appeared in Feb 1960. At that time the issues were given a series number and then an issue number. Therefore the first issue was Series 1 No. 1. As the first release came out in February there are only 11 issues in the first series. Series 2 - 5 had 12 issues in each series. Part way through Series 6 a new numbering system was used. The last issue on the old numbering system was Series 6 No. 9. There were a total of 68 issues on the old numbering system. The new numbering system took this into account and started with issue 69. The last issue of Elvis Monthly was No. 483. In addition to the regular issues there were a number of extra magazines and in 1977 Issue 1 was reprinted with a special wraparound cover. 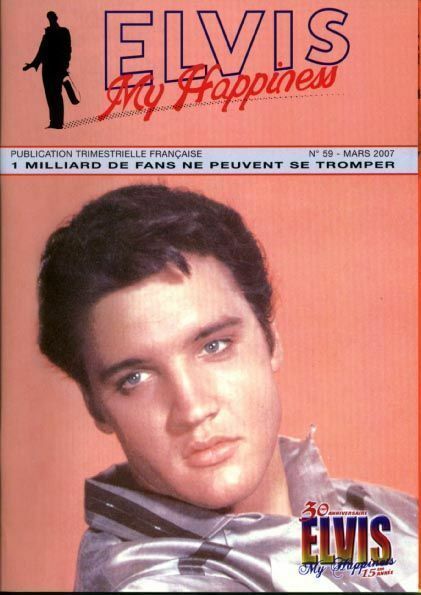 Comme pour les Beatles, le Monthly d'Elvis était une référence pour les fans de l'époque ! Et puis, quand je dis complète... pas vraiment non-plus. This is a collection of Beatles Monthly's from August 1963 to December 1969. All books are in good condition except No1 issue which has some writing on the cover and inside, but it is the No 1 issue. Plus free, Beatles book "Special Repeat No 1" best pix from ther first six issues, in good condition, and "The Beatles Book Special Xmas Extra" from 1965 A4 size, cover has staple damage but the rest is good condition. C'est juste la première série. Celle sortie du "vivant" du groupe. Un peu de moins de 6 ans au rythme d'un par mois. Plus les rares hors-séries de temps à autre. Quelques 77 numéros quoi ? J'en suis presque jaloux ! non, en fait je suis jaloux !!! Mop disait: J'ai une bille, vous avez tout le sac, et vous voulez ma bille! Ne sois pas Jaloux, Orgeat, tu as bien plus de belles choses que moi, et je ne suis pas jaloux, juste envieux!! Non, il vaudrait mieux que tu restes, parce que c'est moi qui sors. ..bon on sort ensemble alors ?